Another week, another dollar.. another round up of solid DJs to grace the decks in our little gaffer. We’re are very excited to announce the Irish debut of Parisian DJ and producer DJ Suspect. Representing the global DJ collective 45 Live and now Dusty Donuts latest signing, expect an eclectic mix using seven inch vinyl records as his weapons of choice. Kicking off at 7pm, DJ Suspect will be in control as he mixes, splices and dices those lil’ records to within an inch of their lives. 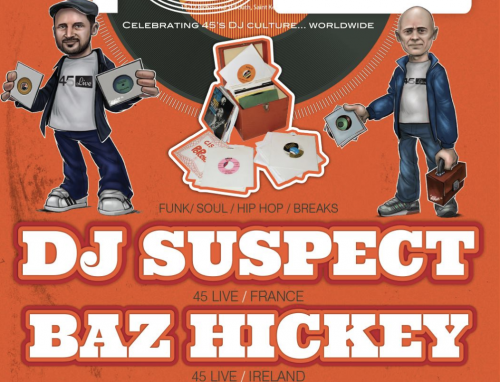 On the night DJ Suspect goes back to back with his 45 Live DJ partner from Dublin, Baz Hickey. Check DJ Suspect out below in all his 45 goodness.